Eagle Point offers a dynamic mix of beginner to expert terrain, the 435 terrain park & significant backcountry opportunities. An average of 450 inches of annual snowfall, enjoy 40 runs and 600+ acres. Two day lodges with dining, a European-style mountain top warming area, retail and rentals, and a learning center will ensure an enjoyable experience for all. The skiing/riding at Eagle Point is just a 3 hour drive north of Las Vegas, with easy access off I-15. 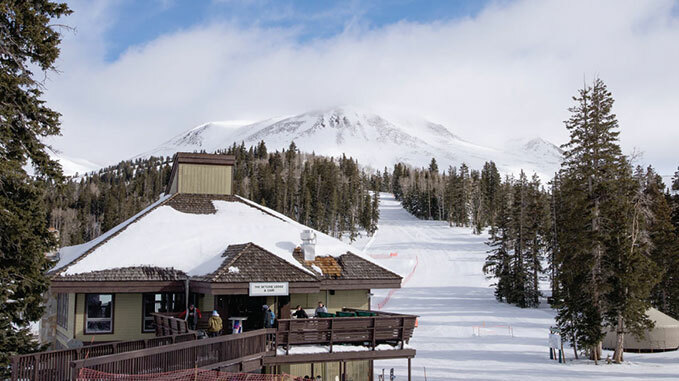 Flights in and out of Las Vegas make Eagle Point a choice destination for combining great skiing/riding with National Park adventures. Eagle Point is an easy 6-8 hour drive destination for Southern California and Phoenix. Private condominiums and additional lodging options are available. Visit www.EaglePointResort.com for a complete listing of accommodations. Eagle Point boasts two completely-renovated lodges and a brand new warming station called The Lookout, located at the top of Tushar Ridge. Start your day at the Skyline Lodge located near the upper parking lot. Here you will find ticketing, lessons, rentals, The Skyline Café, and access to fantastic beginner and intermediate terrain. Canyonside Lodge is home to The Outpost Grill, with a variety of choices to satisfy all appetites. Skiers and non-skiers will enjoy quiet, comfortable dining here, featuring house-made specialties for lunch or dinner.